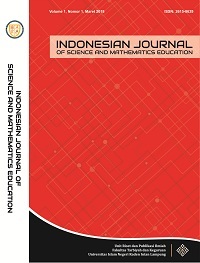 Indonesian Journal of Science and Mathematics Education is a journal which is managed by Research and Scientific Publication Unit collaborate with Physics Education Department of UIN Raden Intan Lampung. Indonesian Journal of Science and Mathematics Education is a medium of communication used by researchers, lecturers, teachers, practitioners, and University student for submitting result of studies and prioritized result of research in the field of science and mathematics education, include: development of instruments of evaluation science and mathematics, development of instructional media science and mathematics, and the development of learning model of science and mathematics. First published in 2018 and regularly published three (3) times a year, in March, July and November. The script that is loaded is the original manuscript, not yet published in other publications. Editor receive from the author of researchers, lecturers, teachers, practitioners, and University student for submitting result of studies and prioritized result of research concerned with Science and Mathematics Education Development.